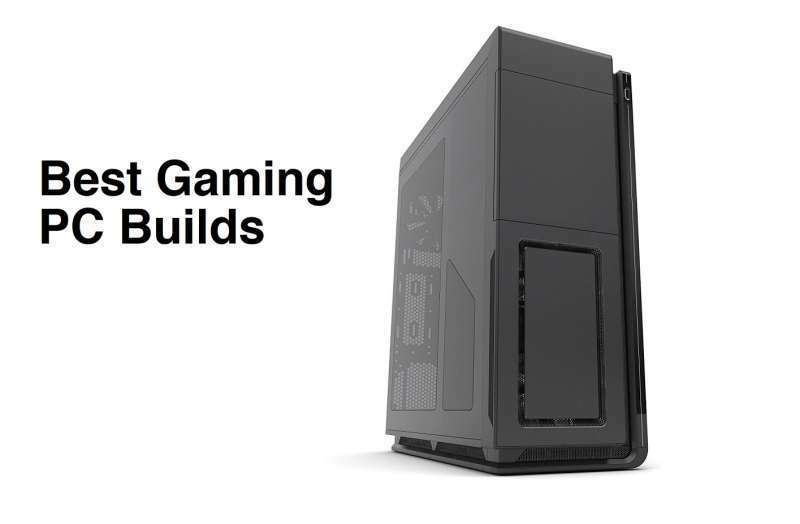 Below you’ll find four builds sorted by budget of what we think will help create the best and most powerful gaming PCs for the price. Each piece of hardware in each build is hand-picked by our staff through consideration of a multitude of criteria such as price, performance, reliability, and cost. Furthermore, hardware recommend for our builds all have either been reviewed by us or is well known and highly regarded by the hardware community to ensure that our recommendations will give you the best gaming PC out there for the price. We’ve also designed our builds to be extremely balanced as well, favoring not only in-game FPS (frames per second) but not sacrificing cooling performance or aesthetics. For those with budgets somewhere between the builds specified, we’ll also offer some information about component alternatives below each build that can simply replace the recommended components. These are generally recommendations for different graphics cards or storage devices that can offer significantly improved performance. As usual, this article is meant to serve as a guide for reference purposes only. Hardware prices and availability is constantly fluctuating, so if any piece of hardware listed below is out of stock, or is priced improperly, please help by letting us know in our community forums. The purpose of our entry level gaming PC is simple – we want to give casual gamers a relatively cheap, budget computer build that would allow them to play older, less graphically demanding games at medium to high settings as well as newer games at lower detail/resolution settings. CPU – While the Ryzen 5 2600 is a very capable CPU for a bit more you can currently buy a Ryzen 7 1700 for around $40 more which will help in multi tasking and other general tasks. Those on a tighter budget can opt to skip the Ryzen 5 2600 and pick up a Ryzen 3 2200Gwhich is onlly a quad core as opposed to six and lacks SMT which drops the thread count from 12 to 4 but also includes integrated graphics and can be used as a temporary solution or good enough for most e-sports games. For a bit more you can add a Cryorig H7 and push this CPU to its limit (between 4.1GHz and 3.9GHz) while still remaining relatively cool. Motherboard – While the Gigabyte B450M DS3H is a solid board for the price for around $20-30 more you can pick up the superior Asus B450 Prime It bosts superior overclocking capability as well as RAM compatablility and I/O. GPU – For those who want to opt for an Nvidia card if they prefer Geforce Experience or ShadowPlay can opt for the GTX 1060 3GB, though the RX 570 generally is the better card performance wise. Those looking for an upgrade to higher tier performance can pick up an Radeon RX 580 and it will provide better gaming performance for 1080p or 1440p gaming in modern games, Finally AMD’s newest introduction the RX 590 RX 590 is a bit pricer but is probably the best card you can pick up at the under $300 mark, but is around $60 more than the other cards. The concept of the mid range gaming PC is pretty much going to be a machine that gives gamers the best “bang for the buck”. Each piece of hardware here is maximized in price to performance, but we also try to build the machine so that the price range is where performance is considered “good enough”. With this gaming PC, most games will be running at high settings if played with a 1440P and easily do 1080P Ultra in most triple A titles. This build will also provide entry to mid-level performance for VR games. CPU – The i5 9600K should be enough to play most current titles though if you want a little extra left in the tank for the future or you plan on gaming while multitasking the i7 9700K is also a good option on the Intel side for a bit more. For the AMD side of things depending on how much you want to stream or have productivity workloads, you may want to consider jumping up to a Ryzen 7 processor. You can get a slightly older model which wont overclock as high per core but will give you more CPU cores overall for around the same price, or you can hop on up to the Ryzen 7 2700, and Ryzen 7 2700X, Though if you only plan on gaming the 2600X is an absolutely fantastic CPU for gaming. GPU – The GTX 1070 is a very capable graphics card that will play the latest games at 1440P and absolutly kill 1080P ultra at a high refresh rate but those who want to be able to push past 80 FPS+ consistantly in the latest titles at 1440p and above should consider the the GTX 1070 TI or GTX 1080 is far better suited for this task. Also if you have a bit more ro spare in the budget an RTX 2070 or RTX 2080 allows you to use Nvidia’s new ray tracing functionality and other new features such as DLSS. Finally depending on the price AMD’s Vega 56and Vega 64 cards are around and I would recommend them if they;re priced below $375 and $450 respectively. Boot Drive – Another easy upgrade is the SSD. For ultrafast load times, a PCIe SSD such as the Samsung 970 EVO is an excellent candidate that provides significantly better performance compared to the Crucial MX500. The high end gaming PC is going to be something that can run everything at 1080P or 1440P at high to ultra settings. This machine will burn through any game on the market, and will have plenty of room for expansion as well. Those interested in playing VR games or games at 4K resolutions will find that this build will be more than powerful enough do the job although performance in might not be quite as good as our extreme gaming PC build. GPU – The GeForce RTX 2070 is a powerhouse card, roughly the power of a GTX 1080 but for gamers who want the ultimate VR or 4K gaming experience, the GeForce RTX 2080 or the GeForce RTX 2080 TI is without a doubt the graphics card to have. Boot Drive – While the Samsung 850 EVO is an excellent SSD for the SATA interface, those who want the ultimate performance will want a NVMe PCIe SSD. Whereas SATA is limited to 6Gb/s, PCIe is only limited by the version of PCIe and the amount of PCIe lanes available. As a result, a PCIe Gen 3 x4 slot is capable of nearly 4GB/s while a PCIe Gen 3 x8 slot is capable of nearly 8GB/s. While most PCIe SSDs won’t provide performance anywhere near the theoretical limits of the PCIe interface, the Samsung 960 PRO comes close with performance rated at up to 3.5GB/s sequential reads and 2.1GB/s sequential writes. Finally, we’ve also got the extreme gaming PC. This is the coveted gaming PC that will run most games on the market today at 4K with all the highest graphics settings enabled. Additionally, this kind of system is optimized for VR (Virtual Reality) and multi-display setups as well for that ultra level of immersion. The 9th Generation Core processors launched earlier this fall, with shortages abound and prices exploding due to demand, the new i9 9900K was even available for $1000 at one point almost doubling its MSRP. Prices have normalized and have allowed consumers a choice once again. These see a relatively similar product in the i5 9600K with it performing almost exactly the same as the previous gen CPU when clocked at the same speed and with very similar overclocking performance not a lot has changed, though with the i7 Intel decided to drop hyper threading all together for an 8 core design, this seems to perform relatively equal to a 8700K when all things are equal with slightly better gaming performance. Finally their newest product the i9 9900K is a beast of a chip with 8 cores and 16 threads, it’s also capible of reaching up to 5GHz+ although is power hungry and takes some serious cooling. AMD on the other hand has their second gen Ryzen products which have seen price cuts and are quite competitive. AMD will also be expected to launch their new Ryzen 3000 series CPUs with the new Zen 2 architecture at the start of this year. We hope to hear more information after CES. Nvidia launched their RTX 2000 series cards which came in at a price no one expected, with the highest end RTX 2080 TI coming in at $1,200 shocked the market, causing quite heated debates among enthusiasts. The price jump was somewhat understandable due to how large the die is as well as the money spent on the new Tensor cores and RT cores which are used for ray tracing. That being said it still is a somewhat hard sell for those, since only one game currently, Battlefield 5 even has active support for ray tracing. Nvidia does have plenty of games on tap, though and hopefully early adopters will be able to play more titles with ray tracing functionality soon. AMD however has been rather quiet with the exception of the release of the RX 590, a final version of AMD’s Polaris architecture first seen in the RX 480 two years ago. It uses AMD’s 12nm manufacturing and as such reaches clock speeds much higher than other Ppolaris cards with them frequently hitting 1600MHz. The PC gaming hardware landscape continues to evolve as AMD has begun rolling out their 2nd Generation Ryzen CPUs and its companion platform. The latest processors continue to improve on AMD’s 1st generation core processors, offering increased IPC performance than its predecessor at a similar cost. Intel continues to roll out their 8th Generation Core processors with the 9th Generation Core Processors expected towards the end of the year. This year’s biggest announcement on the GPU side is the release of Nvidia’s newest Turing architecture GPUs. The new GPUs, marketed under the RTX 20xx naming scheme, offer substantially improved performance and innovative features such as real-time ray tracing, when compared to the GTX 10 series GPUs. Unfortunately, the Nvidia RTX 20 series cards will be initially available only for the high end graphics card market, so those building more entry level systems will have to still go with a GTX 10 series GPU at this time. AMD continues to offer their VEGA architecture graphics cards however, nothing new is available at this time. The RAM market is finally stabilizing in terms of supply and demand, but prices continue to be high. Prices are expected to stay that way until the end of the year. SSD pricing on the other hand is finally seeing a bit of a drop thanks to improved supply and NAND density improvements. Since our last major gaming PC build update in July, Intel has announced and subsequently launched their 8th Generation Core i3, i5, and i7 processor lineups. The new processor lineups offer relatively small changes in per core performance (IPC), but each of the CPU lineups get two additional cores compared to the previous generation giving the Core i3 processor lineup 4-cores/4-threads, the Core i5 6-cores/6-threads, and the Core i7 6-cores/12-threads. Along with the new generation of processors is also the Intel 300 series Z370 chipset which is a fairly minor update in terms of features when compared to the Z270 chipset however, the 300 series chipset is needed for those who intend on purchasing an 8th Generation Core processor. Those currently intending on purchasing an Intel system will be fine either purchasing a discounted 7th Generation Core processor based system or waiting for the 8th Generation Core processors to become more available. For those looking for an AMD Ryzen platform based system, things have largely remained the same since our last update. Since then, AMD has rolled out significant updates to their platform which continues to improve gaming performance. AMD has also rolled out their Ryzen Threadripper based systems as well, but gamers will find that the Ryzen 5 or Ryzen 7 will be the sweet spot with the Ryzen Threadripper processors better suited for highly multi-threaded applications such as video editing, 3d modeling, etc. The biggest update for GPUs is Nvidia’s introduction of the GeForce GTX 1070 Ti. The GTX 1070 Ti is based on Nvidia’s Pascal architecture and features 2432 CUDA cores which puts its performance somewhere between the GeForce GTX 1070 and the GeForce GTX 1080. As for supply, while earlier this year graphics card supply was highly contained due to cryptocurrency miners purchasing most of the stock, availability has returned for most graphics card. However, prices are still hovering closer to MSRP as cryptocurrency miners are still purchasing most of the stock. Currently, there’s no expectation that this will slow down anytime soon. As you may have noticed, RAM is still extremely expensive due to shortages caused by massive demand and lack of supply. The RAM shortage isn’t expected to end until at least mid-2018, so prices are expected to continue to remain high. The NAND shortage on the other hand is expected to come to an end this quarter or early 2018, so pricing and availability should become fairly good in the next few months if it isn’t already. The biggest new development in recent months is the release of Intel’s new HEDT platform codename Skylake-X and Kaby Lake-X. These new processors are based on Intel’s new X299 chipset and at the very high end scale up to a whopping 18-cores/36-threads in the Intel Core i9-7980XE CPU although this isn’t expected to actually be available on retail shelves at least for another few months. On the AMD side, AMD’s Ryzen has received numerous updates, with a majority of the updates targeted towards gamers, content creators, and the enthusiast community. As a result, we’ve been very impressed with the direction AMD Ryzen is headed and have included options for AMD Ryzen builds alongside Intel builds as well. At this point, we have no reservations about purchasing an AMD Ryzen build as many of the major initial bugs have been eradicated at this point. Of course, if you purchase an AMD Ryzen build, be on the lookout for updates as it seems like AMD is very regularly releasing driver and CPU microcode updates. Down the road, budget gamers should watch out for AMD’s Ryzen 3 processors which should roll out shortly. These are expected to be priced very aggressively compared to Intel’s Core i3 yet offer significantly better performance. Additionally, in the next month or so, AMD is expected to release their Ryzen Threadripper CPUs which scale up to 16-cores and 32-threads. These are expected to come in at a very aggressive pricepoint compared to Intel’s HEDT Skylake-X and Kaby Lake-X. We’ll keep an eye out on availability and the initial reviews and update the build guide accordingly. On the GPU side, not much new has changed. High end Nvidia Pascal architecture based graphics cards (GeForce GTX Titan Xp, GTX 1080 Ti, GTX 1080, GTX 1070) still reign supreme in terms of top tier performance, and both Nvidia GeForce (GTX 1060, GTX 1050 Ti, GTX 1050) and AMD Radeon (RX 580, RX 570, RX 560) remains competitive in the mid-range. but little of that matters since cryptocurrency miners have made GPU availability extremely scarce, especially AMD Radeon graphics cards which provide the best GPU mining capability for the price. If you can find a GPU at its MSRP and you need one, I’d highly recommending purchasing immediately as GPU makers are having a very difficult time keeping up with demand. During SIGGRAPH 2017, AMD is expected to launch their AMD Radeon RX Vega graphics card which is the first high end graphics card they’ve released for a very long time. According to the latest leaked information, the RX Vega is expected to have performance on-par with the Nvidia GeForce GTX 1080. There’s still a major DRAM and NAND shortage which is inflating prices of RAM and NAND. Whereas previously this was expected to end in Q2 of this year, the supply shortage has been extended until next year due to demand for the components by mobile devices. If you’re looking to buy a new RAM kit or a new SSD and there’s a good deal, we’d recommend purchasing it before supply shrinks even more for the holidays. As for other hardware, there’s little new development at this time. *Maintained Intel 7th Generation processors as the recommended processors for Intel builds as 8th Generation Core i3, i5, i7 processors currently still low on availability. Question about why we chose X and not Y? Ask our community! We’d be happy to make recommendations on alternatives, provide you tips on putting the entire system together, or even suggest you a 100% custom build better fit for your needs. All you have to do is visit our forums, register, and post in the appropriate section! Also don’t forget to join us on Facebook, Twitter, Google Plus, or YouTube to be updated on the latest news, reviews, tutorials, custom computer builds, and more!